Buying and selling is certainly not a new concept for us anymore. We all are aware that it requires some conditions to be fulfilled prior to both the actions have done. It is not only necessary for the buyer to know of full information of the seller but also the seller must be well aware of the buyer. Once the trust is established, the process thereby starts. 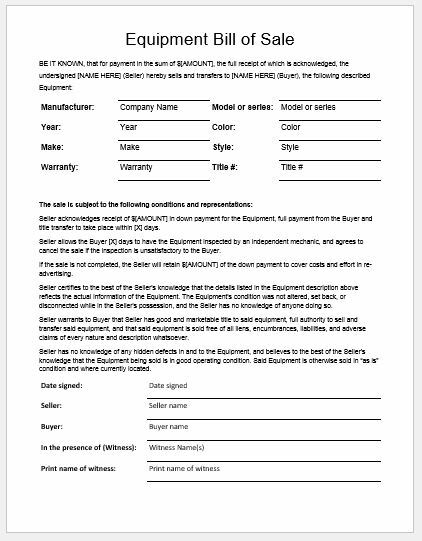 An equipment bill of sale is a document presenting an agreement reached between a buyer and a seller as the result of purchase done. It will be used as a proof between buyer and seller for the legal purchase of the equipment. The buyer can readily demand the inspection of the equipment before the sale completes. The equipment bill of sale would thereby list all the agreed terms and conditions between the buyer and the seller. It serves as a legal proof of ownership. Once the buyer acquires the ownership of the equipment, the seller would no longer be responsible for any repairs, damages or maintenance. How to sell an Equipment? Here are some of the most common ways a seller can use for selling an equipment. Advertisement: social media is the most powerful tool for finding buyers and sellers. Advertise your equipment on equipment specific websites. A newspaper is also a good idea. Cleaning: Before presenting your equipment for sale make sure that it is clean so that it is presentable to the buyer. Price: You need to know the market value of your equipment before sale in order to negotiate for a reasonable price. The following information be presented under this letterhead.